Galerie Rolando Anselmi is pleased to announce Immemorial, the first solo echibtion at its space in Berlin by British artist Jodie Carey. Ideas of time, memory and materiality inhabit the works of Immemorial. Commisioned and created especially for the gallery - in collaboration with Neue Berliner Raume and curated by Mauel Wischnewski - this body of work continues the artist exploration of life's fragility and its brevity as well the resonance and meaning that materials can evoke in scultpture. Housed in the main room, the installation Untitled (Immorial) provides the title for the exhibtion. Long lengths of hand-woven cloth fall from ceiling to floor, mirroring the architecture of the space. What appears initially to be quite simple work hides a complex process of production. The linen thread used to weave the cloth has been lightly stained with dyes created by the artist from the individual flowers of a bouquet. The changes in colour are gradual: soft and subtle. Carey has then engaged in the arduous process of weaving by hand the thread to make cloth, transforming the original bouquest of flowers into a lasting memorial that resonate with references to time passing, morality and commemoration. These are soft, elegant and graceful memorials that evoke the body through the sensual texture of the cloth. In the second room, close to the entrance the artist will present a second installations Untitled (Rope). Here the linen thread has been twisted and braided by hand, transforming the fine thread into a sculptural object. Inherently formless, the rope drops down from the ceiling and knots on the gallery floor, challenging the permanence and solidity normally associates with the traditional monument. Untitled (Rope) is tall and refined, while retaining a fragility and delicacy that is at odds with the somewhat melancholic associations of the hanging rope. 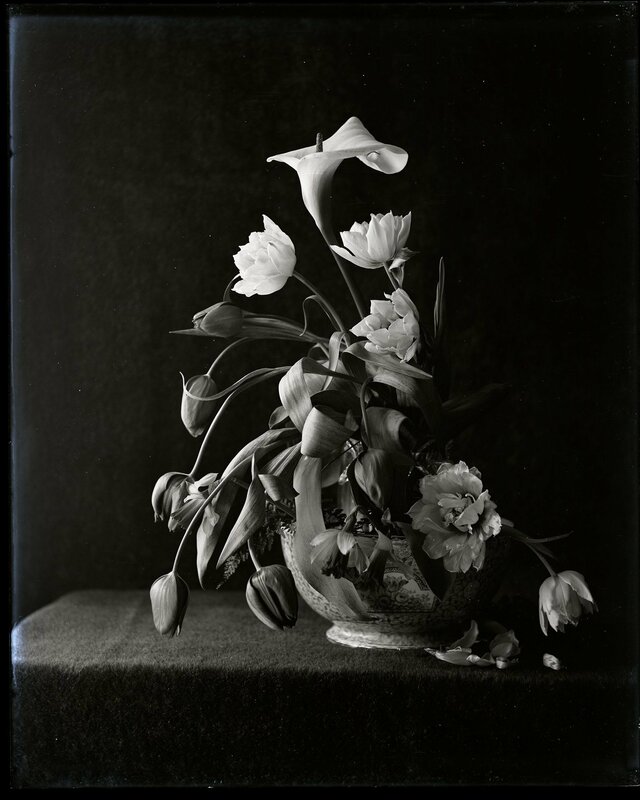 the show includes then a series of five frames black and white prints, Elegy, showing wilting flowers in vases against makeshift fabri backdrops. The original source material was a series of rare glass plates used as part of a photographic processes rarely used since the 1920's. They represent a forgotten and now redundant skill and the subject re-aligns us with the original bouquet of flowers and the theme of morality so frequently considered throughout the history of art and literature and recurring motif throughout Carey's works.